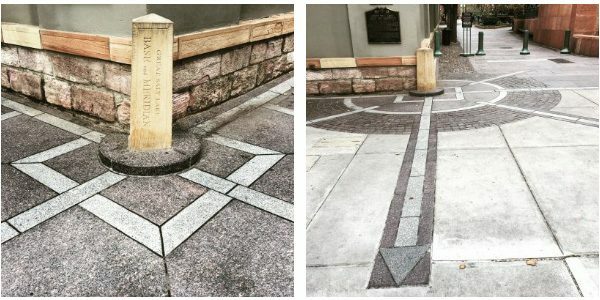 The urban grid of Salt Lake City, Utah is designed to tell you exactly where you are in relation to Temple Square, one of the holiest sites for Mormons. Addresses can read like sets of coordinates. “300 South 2100 East,” for example, means three blocks south and 21 blocks east of Temple Square. But the most striking thing about Salt Lake’s grid is the scale. Blocks are 660 feet on each side. That means walking the length of two football fields from one intersection to the next. 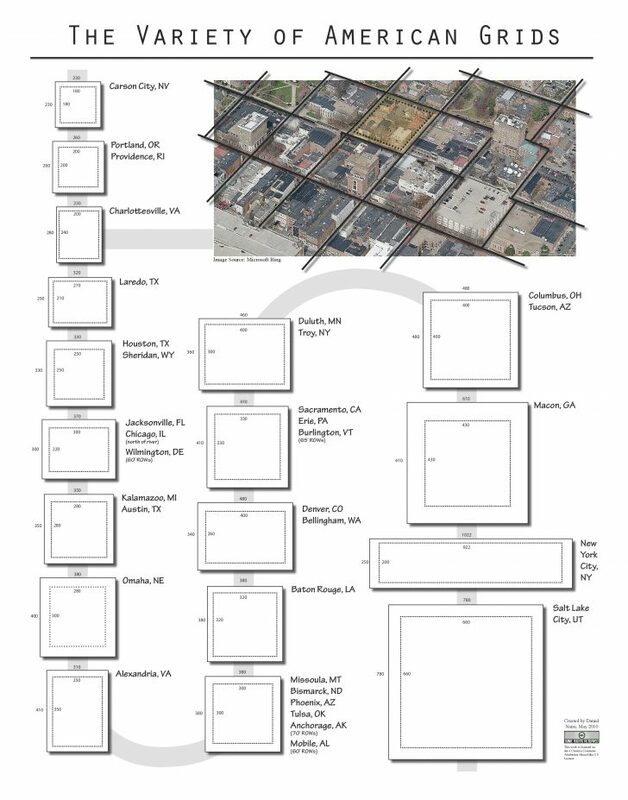 By comparison, nine Portland, Oregon city blocks can fit inside one Salt Lake block. 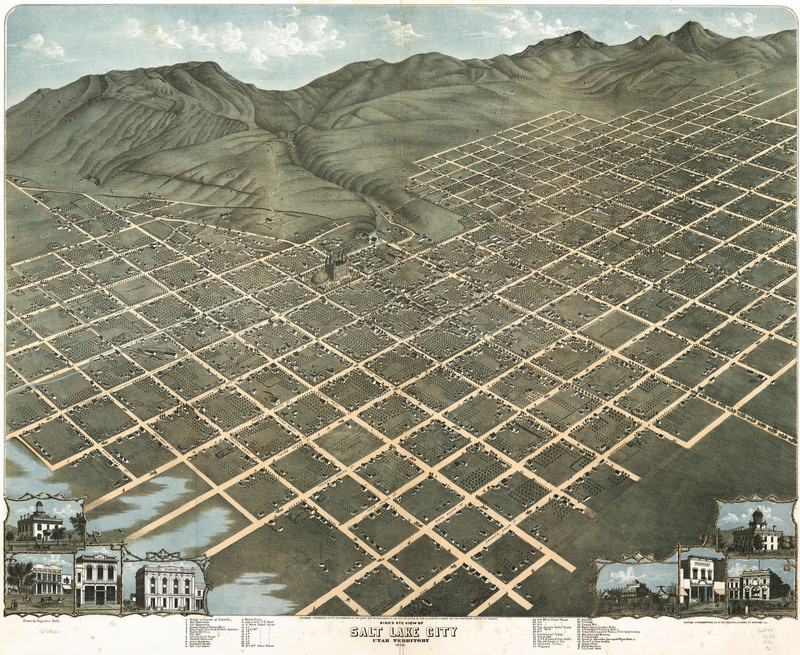 Created by Mormon settlers, the grid of Salt Lake was part of an effort to create a spiritual utopia. Joseph Smith, founder of the Church of Jesus Christ of Latter-day Saints, began this plan with a document called the Plat of Zion. 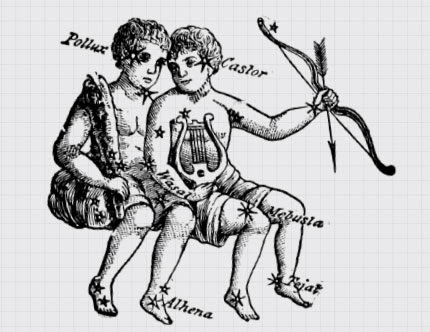 The plat provided details as to the measurements of roads, how lots would be arranged, how many people would live there. 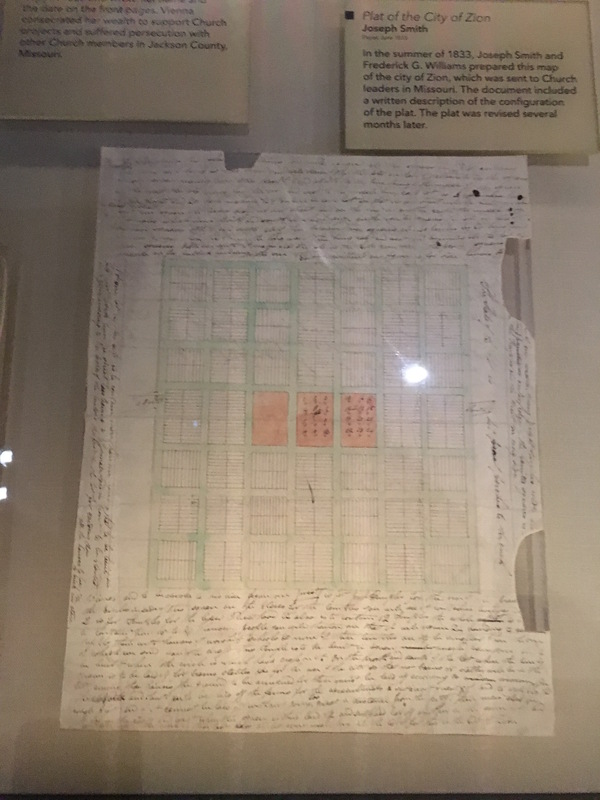 The original document can be found on display in the Church History Museum in Temple Square. It’s a fairly simple plan—large blocks set at right angles, all the same size, except for special blocks in the middle, which Joseph Smith imagined would hold 24 temples. This imagined city would be as populous as New York or Philadelphia were at the time, and would offer the best parts of a city—infrastructure, education, and community—but without vice and crime. Joseph Smith thought this could be achieved by giving residents lots of space; it would essentially be a rural city. Within the large blocks, each church member would have a plot of land for fruit trees and vegetable gardens, along with a home, which Smith imagined as the essential piece of the urban fabric. Joseph Smith never got to experience his utopian community—he was killed by an angry anti-Mormon mob in 1844. Leadership of the church fell to Brigham Young, who led his followers to the Salt Lake Valley. They established Salt Lake City in 1847. 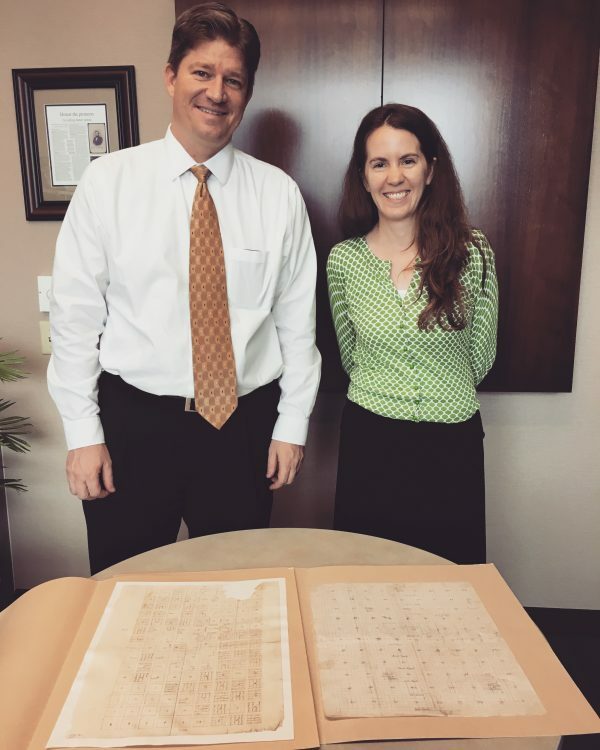 Keith Erekson, director of the LDS Church History Library, and Emily Utt, historic sites curator for the LDS Church, with one of the original drafts of the Plat of Zion (right), and Brigham Young’s original urban plan for Salt Lake City (left). Brigham Young took Smith’s Plat of Zion as a point of departure, but realized quickly that this utopian ideal had some real-world problems. Rather than build 24 temples in the heart of the city, Young started with one. Young also realized a city couldn’t survive on businesses run out of people’s homes—it would need commercial and industrial districts. But in many ways, Brigham Young remained faithful to the Plat of Zion. One such way was in building streets with a width of 132 feet. Which is why today, many streets in Salt Lake City—even in the downtown core—are six lanes of traffic wide (some are narrower due to larger sidewalks). Street width, as well as the length of each block, can make the city feel hostile to pedestrians. The streets are so menacing and crossings so long that the city has placed plastic buckets on lampposts which hold flags that pedestrians can carry to the other side while crossing. Not only are long blocks and wide streets more dangerous—they also offer little reason to walk in the first place. 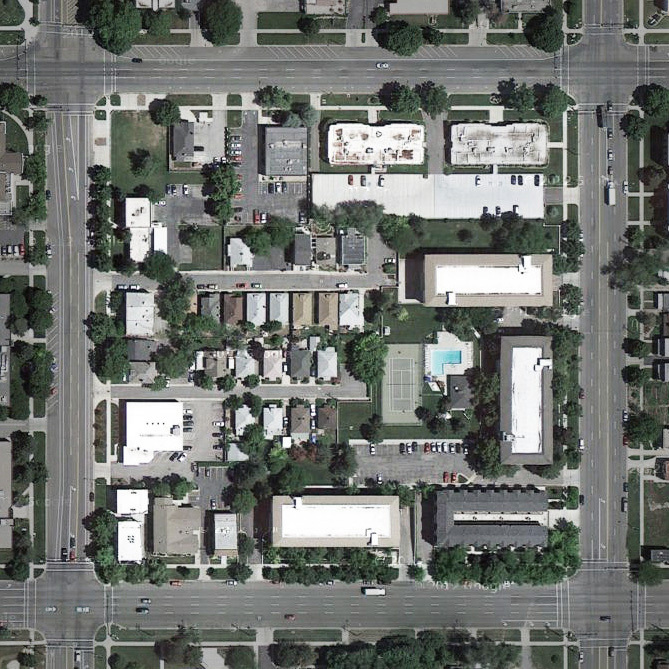 Urban planners have long known that short blocks are inherently more interesting. Shorter blocks mean more intersections, which mean more opportunities for people to interact with one another, and more pathways to move through the city (of course, they also mean more street space and less taxable real estate). In present-day Salt Lake City, it’s hard to get around without a car, and much of the city doesn’t exactly invite pedestrians to meander through its urban fabric. But the problems confronting Salt Lake City today may not have been the fault of its founders. Andres Duany of the architecture firm DPZ and co-founder of the New Urbanist movement sees in Salt Lake City many of the same goals he strives for himself in his own work: walkability, community, low environmental impact. The problem came in the 1930s and 40s when urban designers began to plan around the car. Before then, says Duany, the roads were not paved curb to curb; rather, they were more of a greenspace, with pavement on in the places where horses and oxcarts would go. Similarly, Brigham Young designed large blocks with the expectation that other people would break them down into smaller units as the city evolved. He never meant for the rigid urban grid to remain intact. For Andres Duany, today’s Salt Lake City represents the stagnation of Brigham Young’s dream: it’s gone from one of the most beautiful in the west to one of the most hostile. Duany says that this is a misunderstanding of the intention of Brigham Young, the dream of Joseph Smith, and the framework described by the Plat of Zion. 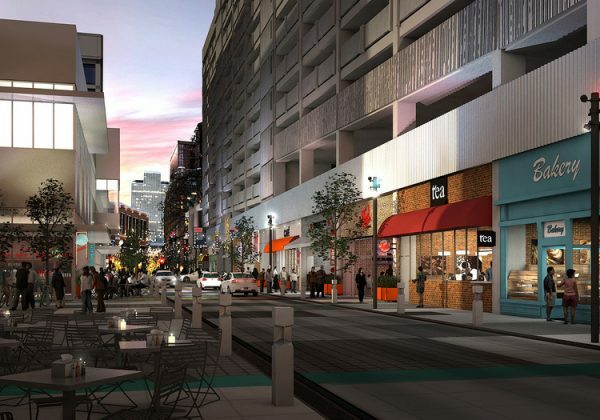 Salt Lake City government is, however, taking steps towards improving walkability in the downtown by breaking up blocks into more human-scaled sections. One current project is on Regent Street, once only an access road to downtown parking structures, which is now becoming a pedestrian walkway that opens up into a plaza for outdoor events. Another, called Granary Row, is bringing pedestrian life into unneeded pieces of wide streets. 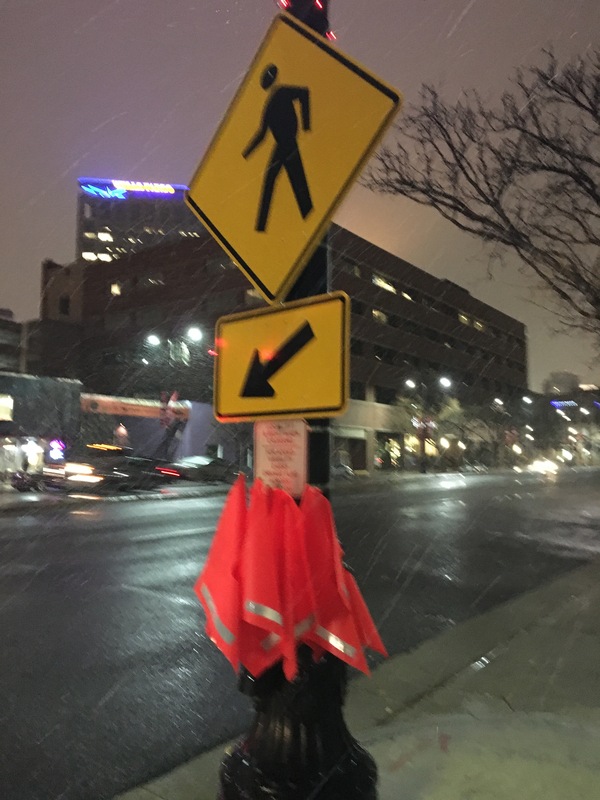 The stakes for creating a denser, more walkable Salt Lake City are high. Even though the city feels wide open, and nature is easily accessible, Salt Lake has some of the worst air pollution in the nation—the mountain ranges that surround it traps in smog. Salt Lake’s population is expected to double by 2050, and will be unable to expand its city limits because of the constraints of mountains to the east and a salt lake to the west. There is some optimism among some residents that they can find better ways to use its large blocks and wide streets, though many planners feel that the new city administration is not as receptive to these kind of tactics as they ought to be. In the Church of Jesus Christ of Latter-day Saints, there is a principle called “continuous revelation.” Perhaps what Salt Lake City needs—and perhaps what all American cities need—is a form of continuous revelation. 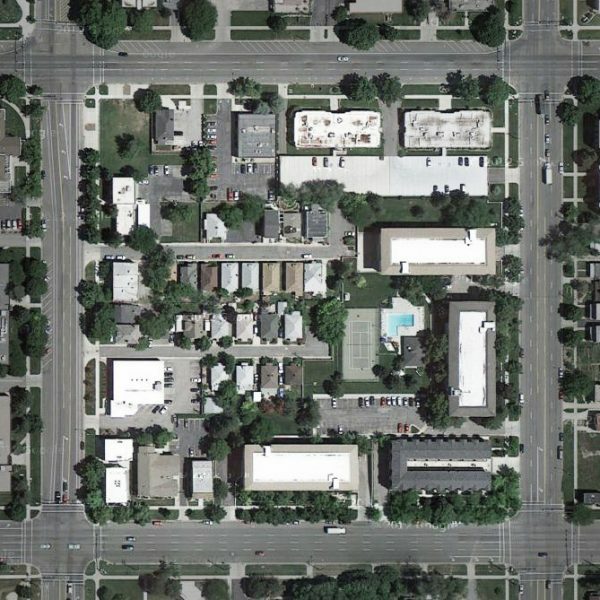 This could pave the way toward honoring founding principles through evolving designs, allowing cities using Mormon grids to adapt and respond to the demands of the present. Producer Sam Greenspan spoke with Benjamin Park, assistant professor of American religious history at Sam Houston State University; Keith Erekson, director of the LDS Church History Library; Emily Utt, historic sites curator for the LDS Church; Molly O’Neil Robinson, urban designer for Salt Lake City government; Andres Duany, a partner with the architecture firm DPZ. Sam also spoke with urban designer and city planner Jeff Speck, author of Walkable City. In this episode, an interviewee described a furlong as 66 feet, or: one length of a surveyor’s chain. In fact, a furlong is ten surveyor’s chains (660 feet). Yes but SLC is on a whole different scale. 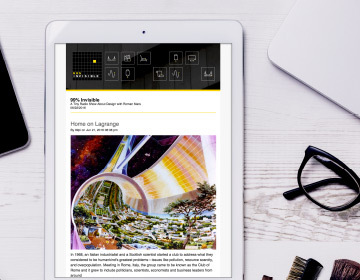 Nauvoo is 4.83 square miles compared to SLC’s 110.4. The size of the blocks have to do with the perfect number 7. The blocks are the size that they are, including the street width, so that 7 blocks makes a perfect mile. I really appreciated the very nuanced way the story mixed history, design, and usability/safety together into a superb narrative. I suspect LDS folks appreciate their history being explained without any agenda other than telling that narrative. Lol, I love how this article hypes up SLC as some sort of Mormon Mecca. Salt lake City is not inherently a Holy place nor a spiritual utopia. Mormons value Temples, which are all over the world. But, SLC is no more holy than some random city in North Dakota. I was more than a little excited to see a podcast about my home town! I’ve followed this podcast forever. As someone who grew up using the grid system, it always seemed like the perfect way to plan a city. Before the era of smart phones and gps, it always made it really easy to find a place just using the grid system. But so many people who are not from here don’t really like it. It’s too confusing. New Yorkers are the biggest complainers about it. They HATE it. So, it made me happy that you guys did something about it. I only have two comments on the episode that I thought might be worth noting. I don’t feel like being a pedestrian is that hostile. I take the train and walk several blocks to work every day, and have never really had that big of a problem with it. I’ve lived in other cities in Asia and had more of an issues there than I ever have had here. I do think there needs to be improvements and, like most things in Utah, change is hard and slow. But it’s not like people are getting hurt all the time or walking around is horrible. I think legislation and growth toward electric cars and self driving cars has SO much more potential than trying to develop and change a city structure. The other point that I wanted to make was that the smog is awful here. Most of Utah’s population is built on a small section of the state right down the Wasatch front, so lots of people, lots of cars, lots of smog. Part of the reason it’s all condensed is because most of Utah’s land is owned by the government…. so there isn’t much place to build out or grow. Landscape contributes a lot but it isn’t the only reason. That is a whole other discussion that I am not qualified at all to talk about. But either way, great podcast. Made me happy to hear about my home town. There is a lot of cool design here. Keep up the good work! Great episode of a great show. I noticed one small mistake though. When discussing the surveyors chain, it was stated that one furlong is 66 feet, the length of the chain. A furlong is actually ten chains, 660 feet. I’ve been hearing these terms a lot recently doing forestry work, and it’s also used often in wildland firefighting situations. An acre was originally one chain by one furlong (66 by 660ft). Anyway great stuff. One great thing about Salt Lake’s wide streets is that the city is bike-friendly by design. It’s easy to establish bike lines, and many streets are wide enough for cyclists as it is. I really appreciated this story. I’ve lived in Utah for the past 6 years, all along the Wasatch Front and currently in Logan. I’ve come to really appreciate the grid system. 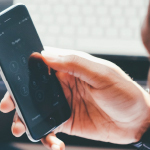 As someone who doesn’t own a smartphone (though I’m working on a computer science degree…go figure), it makes navigation very straightforward. Something the story didn’t mention is the presence of mountains, which makes navigation in a grid system even easier. Unless it is immensely foggy or something, you always know which way is east or whatever, and thus can always orient yourself at any intersection. Being born and raised in St. Louis, MO, I grew up orienting myself more on a turn-by-turn basis…you know (guess?) which direction is west based on the relationship of where you are now to where you started and how many turns you took to get there. Having not lived in St. Louis for 8 years, when I got back I actually find myself getting mixed-up on streets that I USED to know so well…the grid and mountains have spoiled me. A lot of newer areas with their (cursed!) subdivisions have gone back to street names rather than numbers, possibly in part because their meandering streets are constantly changing direction, which doesn’t bode well with the 4 cardinal directions (though they often put the theoretical street numbers in smaller text underneath the street names on the signs). Now I get frustrated when having to navigate such places, because I go around in circles without the help of some higher power (Siri, OK Google, etc). I loved this episode, and had no idea about this aspect of SLC’s history. One thing though: the idea of a ‘perfect grid’ reflecting a harmonious society in touch with God was exemplified by Billy Penn’s plan for Philadelphia about 200 years before SLC’s founding – very similar ideas. I might have paid homage to this in the episode too. Although I get the stress on Joseph Smith’s relative ignorance about urban planning, and that he probably wasn’t familiar with Philadelphia. 1 small error, I believe the greater Phoenix Metropolitan area uses a larger block, at 1 Mi between roads. Interesting. I’ve lived here for over 20 years and walk nearly everywhere. I’ve never felt the town was hostile to pedestrians. Back east where I grew up, they don’t even have sidewalks on most streets. I found that very confusing! This story is great. I’ve lived in Utah half of my life, and only recently found out about The Plat of Zion. 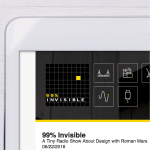 It’s awesome to get more in depth info!! I grew up here and then lived in southern California for 20 years and then came back about 8 years ago. The grid is the best!! In California you HAVE to have a map or gps to get anywhere, unless you already know the area well. In Utah I can find any address without ever having been there, and no gps needed. The only thing I found peculiar about this story was the focus on SLC being “hostile” to pedestrians. In California nobody walks, not even a few blocks! I dropped off my car at a shop once and walked home because it was only about 5 (California) blocks. In that short walk I had no less than 4 people pull over and ask me if I was ok, or if I was stranded and needed a ride. And everyone that didn’t stop took a double take and stared at me funny!! In downtown SLC, especially, there are tons of people who walk! Or bike. I know a lot of people that live downtown that don’t even own cars, as they say they are more hassle than they are worth! And the city is so easy to get around without cars. Of course, if you need to get to a suburb, that may be different. But that is the same way in every metropolis, even New York. There used to be a lot of small streets like Regent Street leading into the center of blocks. They were old streets constructed to reach homes or businesses. It’s city development that eliminated them or made them into sterile driveways. Y’all, 3rd South doesn’t go far enough East to reach 21st. 21st East isn’t possible that far North, because of the University and the mountain.